When is a $19 million 11,200-square-foot mansion with a "resort-style health club," a 60-foot pool and 5,000 square feet of stone terraces not enough? When the view is partially obstructed by the $4.2 million mansion next door. The solution? Tear down the house next door. That's what Clark and Sharon Winslow of Belvedere, Calif., did. They bought the home next door to their sprawling estate at a foreclosure auction and started demolition on the property a few weeks ago, the San Jose Mercury News reported. The mansion, which sold for $7 million in 2004, was repossessed by the Bank of America when the owners fell behind on their mortgage and fled the home. Once demolition is complete, the Winslows plan to use the new open space for gardening. And promptly had it demolished. The Winslows plan to use the newly vacant lot as a garden. As their neighbor Roger snow told NBC Bay Area, "The view is really nice now!" Real estate mogul Morris Moinian got a killer deal on this Southampton, N.Y., property. Originally listed for $3.5 million, Moinian managed to score a closing price of just $2.7 million. According to the New York Post, Moinian plans to tear down the seven-bedroom, 5,700-square-foot home to build a 12,000-square-foot home in its place. Mitt Romney purchased a $12 million, 3,000-square-foot home in San Diego's La Jolla community. But in 2011, he decided it was simply too small for his five children and 18 grandchildren to enjoy. He released plans to raze the house and build an 11,000-square-foot home in its place. The new home will also have a split-level four-car garage with a $55,000 car elevator. Romney can at least enjoy his other homes during the construction. Hedge fund billionaire David Tepper purchased this Sagaponack, Long Island, estate in 2010 for $43.5 million, the most expensive transaction of the year in that area. But instead of enjoying the 6,000 square foot estate, he chose to go in a different direction. He leveled it! Tepper not only destroyed the main house, but he razed the tennis court, filled the swimming pool and destroyed the guesthouse. His plan? Build an even bigger home. David Schwimmer purchased this restored 1852 townhouse in the East Village neighborhood of Manhattan for $4.1 million in 2010. However, it hadn't yet been designated a historical landmark by the city. Schwimmer quickly knocked down the property, much to the chagrin of his neighbors. Elin Nordgren, the former wife of golf superstar Tiger Woods, purchased this Palm Beach, Fla., mansion in March 2011 for $12 million. The home was originally built in the 1920s, but it was infested with termites and wasn't built up to modern hurricane codes. So should she try and fix it up? Nah. Why not knock it down? 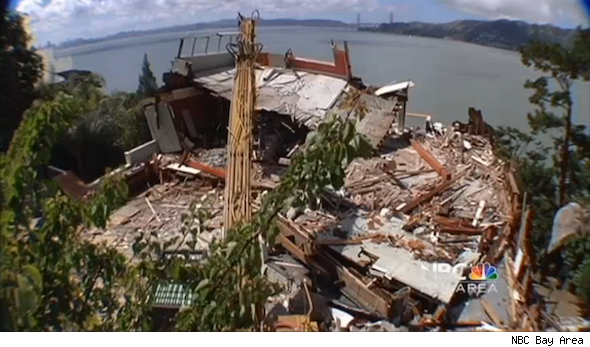 Builders determined that it actually made more financial sense just to destroy the old house. The new home will come with ultra-modern amenities and include a wine room, gym and a theater. The house was about 100 years old, but it was not found to have any historical significance. "The house was pretty beat up anyway," Olivia Hsu of Decker Bullock Sotheby's International Realty told the Marin Independent Journal. "The people hadn't lived there in the last two years." In fact, neighbors welcomed the teardown. As neighbor Roger Snow told NBC Bay Area, "The view is really nice now!"